The Rio Tinto Fortress fell on Saturday. 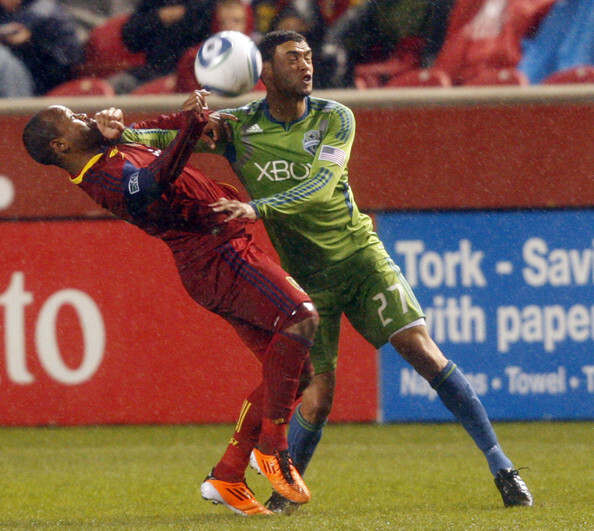 Real Salt Lake have had a tumultuous few months and it culminated in multiple factors over the weekend. Their game against the Seattle Sounders was played in less than ideal conditions, with rain hammering players and the field being waterlogged. 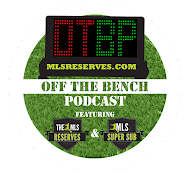 Nick Rimando and Kasey Keller were both called upon to keep their teams from going down in the first half. Neither was forced to produce anything spectacular however both were steady over the first seventy minutes of soccer. The game was back and forth but ultimately devoid of any major action until the red card that set things in motion for an era to end. In the 58th minute though Jamison Olave though proved to be the culprit of Salt Lake’s demise as he hauled down Mike Fucito; denying the Sounder a clear goal scoring opportunity. 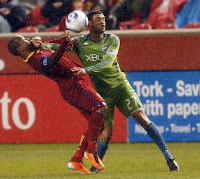 Olave received a red, probably a deserved one, and Real Salt Lake were left to defend with ten. It took just under fifteen minutes for Seattle to capitalize on their man advantage and eventually took a 2-0 lead. 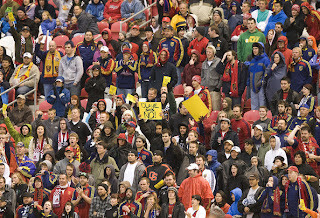 Despite a valiant and undermanned attempt at a comeback RSL eventually fell short and lost their first league game at Rio Tinto in 29 games. The result ended 2-1 in favor of Seattle, however one wonders if this might prove to be more useful than a traditional loss. The truth is an era has ended. However, it would be wise for RSL fans to realize that this is a chance for a new beginning. Gone are the pressures of the Champions League. Gone are the pressures of maintaining a home win streak in league play. And gone now are the pressures of having to be infallible despite the loss of Javier Morales. 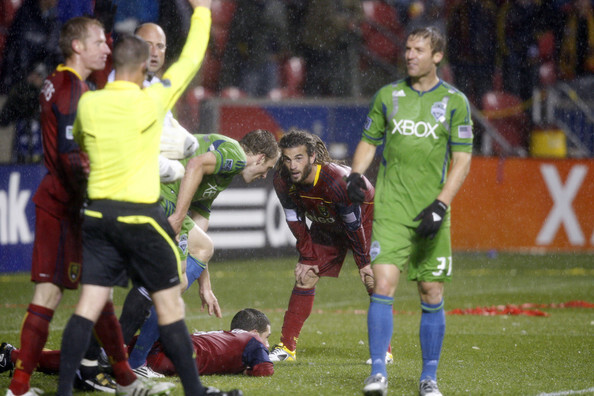 Despite such unsavory conditions under which the Sounders and RSL did battle, an announced crowd of 14,674 were present. This alone should suggest that the team matters in the hearts of fans, sponsors and supporters. Count this fact as a victory. Free now are Real Salt Lake to go back to something they seem to have forgotten: the joy of playing soccer. The players are talented, the stadium is beautiful, the fans are passionate and the coach is wise. There is a recipe in Utah for success unrivaled and it is in the best interest of the team to not dwell on the end of an era, but rather celebrate the new beginning they have before them. Upwards and Onwards RSL.